The judge presiding over the Gov. 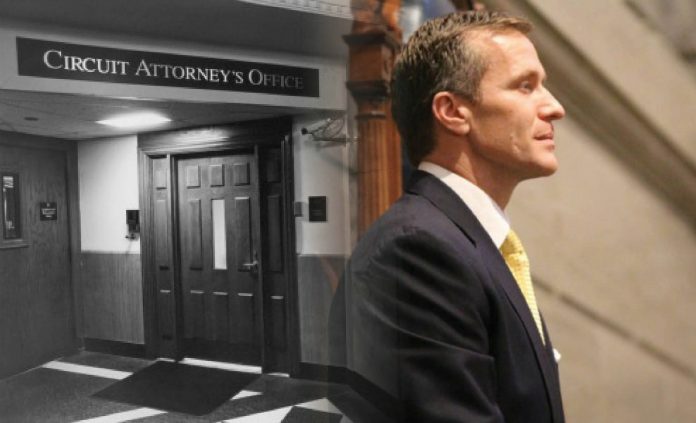 Eric Greitens felony invasion of privacy case said Monday he would rule on the defense team’s motion to dismiss the case Thursday following new complaints that the Circuit Attorney’s office was withholding key information. St. Louis Circuit Judge Rex Burlison gave both parties a deadline of noon Wednesday to add any new filings relating to the motion to dismiss. Jim Martin, a lawyer on the defense team, said that 11 pages of notes of an investigator working for the Circuit Attorney’s office were not given to the defense team until Sunday after he sent an email threatening to bring it up again in court. The new revelation also came after repeated requests from the defense that the prosecution release a video tape in a hearing last Thursday. “We don’t know what she has and that’s a real problem,” Martin said of Gardner. Martin said the supposedly broken video tape of the alleged victim’s deposition “magically appeared” at 6 p.m. last Wednesday, just one hour after the Missouri Special Investigative Committee on Oversight released a scathing report on the governor. The defense team continued to argue that if the tape had been turned over earlier, they would have shown the governor’s former lover was consenting to the affair from the start and accused Gardner of criminal perjury. Gardner said she wasn’t aware of any notes Tisaby took while interviewing K.S., the woman with whom the governor had an affair, and that she wasn’t aware the video was working until last Monday, April 9. The governor also states that investigative report did not contain the evidence that Gardner handed over on Thursday, and the allegations in that report will be refuted by facts, including the video, depositions, discovery, and other evidence that will be subjected to courtroom analysis.